He’s been on the hunt for a while, but our good friend the Tame Geek has finally managed to track down a Tesla. Here’s his review which was first posted over on the Tame Geek ‘site. A little of background if you don’t know why this car is important. In 2008 during the global financial apocalypse, it was more than the banks that took a hit – the American car industry was decimated too. During this time a chap called Elon Musk assumed control of a company he had invested in called Tesla. As CEO and product architect, he has been the most outspoken car company boss in recent memory. The thing is; he keeps his word. The product roadmap for Tesla brought the Roadster, the Model S, the recently launched Model X, and next years Model 3 to market and has spurred (scared) other manufacturers in to rushing forward with their electrification plans. So with that background, you can see that this car is not only important in general, it’s important to me. I’ve been waiting to get behind the wheel of one of these for what feels like forever. The car as tested here is a Tesla Model S 90D. With Tesla we have new kinds of ‘engine’ designations to learn, so with this one, we have a car with dual-electric motors, hence the ‘D’. The 90 stands for the kWh (kilowatt-hours) of the battery. This number relates not just to power, but to range as well. 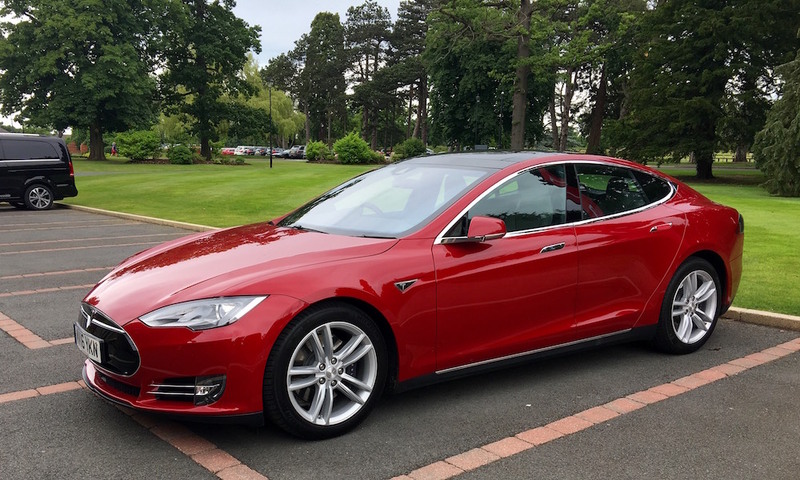 So our Tesla is an all-wheel drive car, with a reported range of 346 miles per charge, and a 0-60 mph time of 4.2 seconds, with a sticker price of £81, 450 (excluding government incentives. 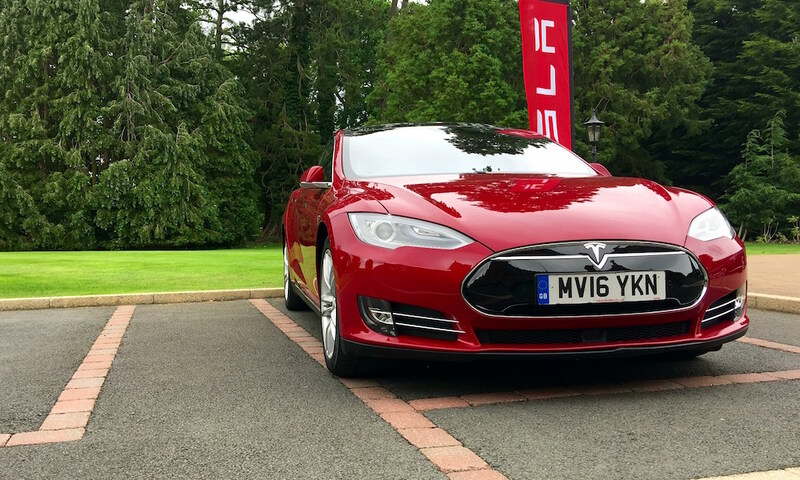 Starting price of a Model S is £57,750 excluding incentives). Oh yeah and an equivalent 417bhp and 485ft-lb of torque, and a top speed of 155mph. What is it like as a car? Like someone doing a really good impression of a celebrity. The Model S has borrowed some design cues from its Audi, Mazda and Jaguar competitors, which give it a distinctly European look and that is quite refreshing for an American car. At the crux of it, the Model S doesn’t feel like an American or a European car. It feels like a truly ‘World car’. A machine that would fit in anywhere and removes the bias of borders. One of the nicest things about the Model S is the fact that some of the design details that are present are the kind of things you only see on concept cars and never in real production models. One of my weaknesses, frameless doors, are present, as are the door handles that slide in to the bodywork when the car is locked, or in motion. On the inside, we have a centre console area that would be filled with buttons in most cars but in the Model S is filled with high-definition display. Said display is again filled with the kind of things the manufacturers have spent years talking about but never following though on to a great level. For instance, other cars have modems built-in, but the Model S uses it’s for access to Google Maps rather than a proprietary sat-nav and music streaming from a premium Spotify account (courtesy of Tesla). I thought that the big screen would have been more distracting, and a bit less useable than it was, but after many software updates it seems to be really quite practical. The design could use a little less skeuomorphism to be fair, but hell – this is one of the first cars in the world to have an upgradeable dash. The area that is usually filled with mechanical dials in the Model S is a TFT display too. This isn’t a massively new thing, given that it is becoming standard in many expensive cars like Audis and Jaguars, but in the Model S, it’s used in a very interesting way. Rather than having dials for RPM and speed the Model S has power usage, speed and more information on the auto-pilot settings. But being a completely new kind of car, the centre display has a real-time view of what’s around the car using all of its sensors. The sat-nav and the music display can also come up in this area, as well as controls for the sunroof, for example. All of the information is presented in a clean and modern fashion. It’s a little odd really considering that in the centre console, there’s a button that looks like a camera for the reversing camera, but in the main dash, Autopilot looks like something out of Tron! It’s nothing a few software updates can’t fix to be fair. The rest of the cabin is very well-appointed. Seriously, it feels like a bit of a trope the whole ‘American car has good interior shocker’ but when it comes to the Model S it’s true. I was mocked for making the point that the stitching was not on a par with Audi or high-end Jaguars, but lots better than mid range BMWs, I was called exceedingly picky! That’s how much I was looking in to the details in this car. Seriously, I wanted to find some problems, but it was becoming difficult. The rest of the car’s functionality was becoming even more impressive. The massive boot, and the additional ‘frunk’ in the front of the car, give it more storage space than a van and there’s more than enough leg room for three grown adults in the back it should seem. So I’ve teased this a bit with going in to how the car looks and what it’s like to be in and a bit about how it works, but I’ve yet to mention how it drives. I’ll cut to the chase (some thousand words in) – it’s mind-blowingly fast. Seriously, it’s a different world of fast. We’ll get to all that though. The Model S gets under motion by using the drive selector on the steering column, which is probably the most American thing about the car. As you pull away in near silence the first thing you notice is the lightness of the steering. It’s probably adjustable in the car’s settings but being completely fly-by-wire it doesn’t really have the kind of feedback you’d be used too. The same can’t be said about the accelerator, as that is a device that’s functions almost entirely on feedback. Yes, you have a ‘go’ pedal and a ‘stop’ pedal, but with the accelerator, when you back off it, the car’s regeneration kicks in, slowing the car quicker than standard engine braking does. It takes you a few miles to get used to this, but shortly after, you’re reminded how inefficient using a brake pedal is and that modulating your speed with the accelerator is a very natural way to drive. Driving out of a sleepy town you’re immediately made aware that this car is a bit big. 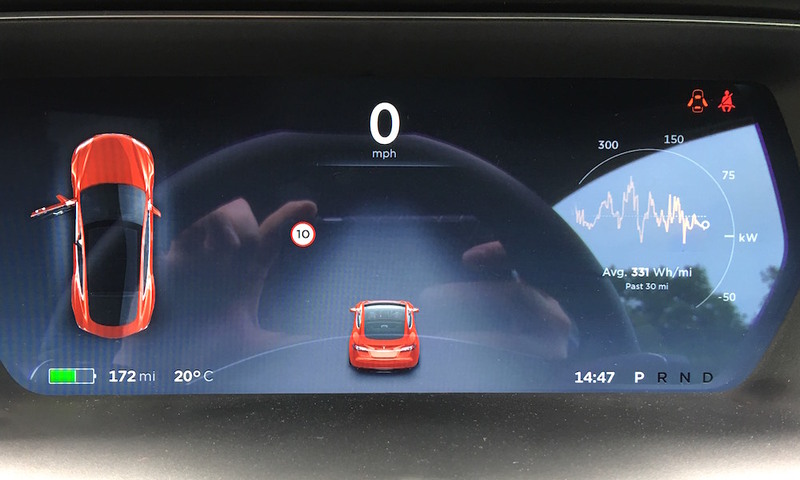 Tesla know this and that’s why the sensors are constantly running, giving you feedback on the distance of other road objects. I’m surprised Range Rovers don’t do this, but then again, when you’re that high up in one of those, you don’t care about what else is around you. Given all its sensors and its zero emissions, the Model S makes for a very compelling choice if you’re in and out of cities and towns a lot. When you finally leave the constricted roads of civilisation, the Model S reveals a major surprise. It has a character! Seriously! It’s a surprise, considering that this is more of a device than a car, but the Model S has a personality when you drive it. This character comes from three elements, the drivetrain, the weight distribution and the power. The drivetrain in this particular model comes with two motors, one for each set of wheels. This kind of set up sounds a bit like a four-wheel-drive system, but the Model S moves with what feels like a rear wheel drive dominance that stems from the torque. With the power being modulated through the accelerator you get a smoother transition between slowing and speeding up, than with a conventional gear driven drivetrain. The next part of the experience is the weight distribution. With it being so low, due to the position of the battery, the car feels very, very planted. The all-wheel-drive and low battery weight, give you a great feeling of stability when cornering. This test model had the standard suspension rather than the adaptable air suspension, which I would expect would add even more stability and grip and smooth the car out when not going forward in a spirited manner. The ride at low speeds is a little tight but not unbearable. I’ve been in worse BMWs for example. 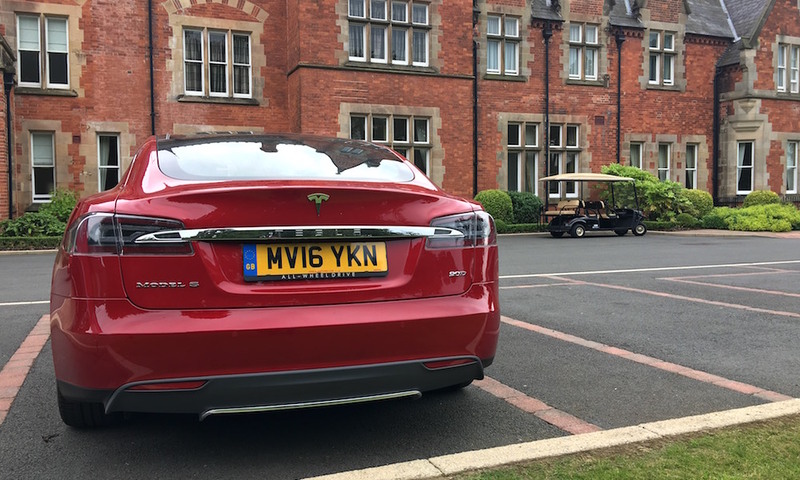 With the Model S having all-wheel-drive, a very low centre of gravity, a low drag coefficient and 417Bhp with 485ft-lb of torque, the character can be summed up as silent power. When you’re driving along and trailing a particularly slow vehicle, you check that it’s clear to overtake and proceed to triple your speed in less than three seconds. The power is intoxicating and corrupting. Seriously, you see the videos of these things out dragging BMW M5s and going toe-to-toe with Ferraris and think that can’t be true. Well, it is. I’ve never felt the security from having this much power in a road car. It’s what I imagine it’s like having control over nuclear weapons. Only you and a few others have this power and everyone else wants this kind of strength. As you can probably tell, this thing has an effect on you. I’d never call anything ‘too powerful’ but I do think that this car would be too much for a lot of people. You quickly learn that just because you can get past anything on the road, you learn that you really don’t need to. You can cruise along in comfort and then if you want, hurtle along in silence and speed that make the car feel more like a spaceship! That’s why I really like Autopilot. There’s been a lot of press about negative situations with Autopilot at the moment and I’m not getting in to those, what I will say is that when used properly it’s brilliant. It’s weird, but brilliant. The first time you activate it, the car simply feels like you’re using advance cruse control with distance control. Where things get weird is the first time the car steers. Most videos I had seen of Autopilot put it in use on motorways exclusively, but I wanted to see how it would handle a single lane A road. The Model S will follow the car in front, at a set distance and keeping you out of their boot, but it will also follow them round a corner. It is certainly not autonomous driving though. The car will prompt you for your input when it’s finding the road markings tricky or it get’s spooked. After using it, I can say I really want Autopilot. When sat in start-stop traffic, it would be your best friend on a morning commute. So, weapons grade ability to cover ground, a luxury environment and a digital assistant that can take the wheel like KITT. What’s not to love? Very little. There are only two things that hold me back from getting this fantastic machine. The first is charging. You’ve noticed that I’ve not mentioned that much. Thing is, the Model S doesn’t feel like it holds you back. You get a real world 250 – 300 miles range from a charge which would cover most driver’s week worth of commuting. 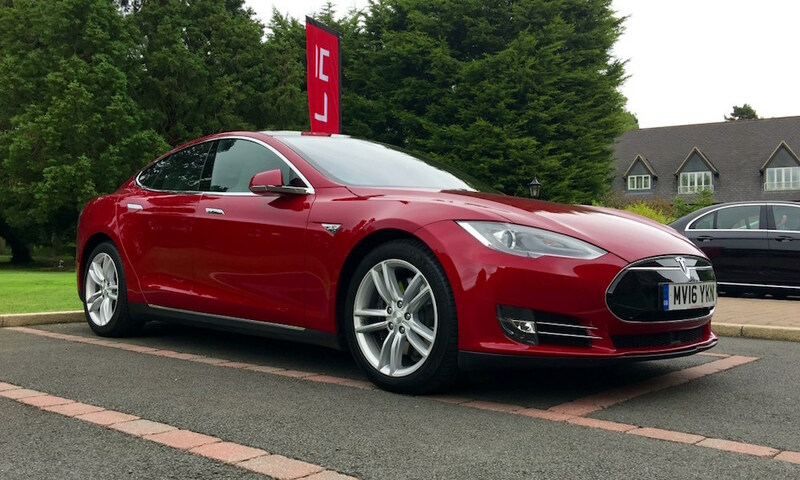 For longer trips and with full access to the Supercharger network, you can go the length and breadth of the country for free. So why is charging a thing that holds me back? Simply, I have nowhere to charge it at home as I don’t have a driveway. The other issue which is more realistically pressing is cost. The Model S is not cheap. Starting at about £58,000 and going to above £110,000 (excluding grants), the Model S is a luxury car and priced as such. The cost over ownership when you consider servicing, tax and fuel savings however, make it a very appealing proposition. Tie that to finance deals that match and beat those from Jaguar and Audi, the Model S becomes even more realistic. There’s a four-year order time on a Model S at the moment. If I had the cash for one, would I order it? Yes and I’d think about home charging later. This car has jumped from being an interesting proposition to a guaranteed purchase in my lottery win garage. A daily drive that would step up against any of my fantasy super cars. I really like the Model S and I can’t wait to see what they do with the Model 3 next year.